Everyone has a story of bracket heartbreak. These are the best ones the SI staff has. The odds of filling out a perfect bracket are comically and famously low, but that doesn’t make every wrong pick hurt any less. In fact, the long odds make it much more painful when one of your picks comes so close to panning out before inevitably crushing your hopes. Everyone has a story of this happening. These are the best ones the SI staff has. Let’s see who can guess my most gut-wrenching, bracket-busting experience by these four words: I went to Virginia. I had the Cavaliers, 2018’s No. 1 overall seed, making it to the Final Four. All I (and my bracket) wanted was to see them in San Antonio—I didn’t even need a championship, I wasn’t being greedy here!—but 16-seeded UMBC crushed those hopes and dreams and busted the hell out of my bracket in the process. The 20-point loss made Virginia the first No. 1 seed in the history of March Madness to lose to a No. 16 seed (womp, womp) and the Golden Retrievers went on to lose to Kansas State in the next round. Given that it was a first-round loss, I had Tony Bennett taking his team pretty far, and it was my team, gut-wrenching and bracket-busting is just about the only way to describe last year’s March Madness experience for me. Heartbreak? UNC fans, I feel your pain. Each year, SI assigns one writer to each Final Four team. And those writers report a potential cover story that runs only if the team they’re reporting on wins the national championship. And the writers for the two teams that win the national semis write the bulk of their stories before the title game. And those stories are edited, so both are almost ready to go before tip-off. It’s a lot of work. And then whether the story runs or not is basically a coin flip. So it was that in 2016, the year I was assigned North Carolina, I had already reported and written the story that would run should the Tar Heels beat Villanova to win another ring for Coach Roy Williams. All I needed was for them to win. I was sitting next to one of our editors, B.J. Schecter, when Marcus Paige made his leaping, twisting 3-pointer to tie the game at 74. Overtime seemed imminent; the cover a real possibility. We all know what happened next? Kris Jenkins. Game-winner. Right wing. B.J. and I both screamed. His was more out of shock; mine because my soul was crushed. They ended up running a version of the piece online, which is sort of like hitting the kind of shot Paige hit only to lose 4.7 seconds later. Of course it was worse for the team, its coaches and their relatives. But, it should be noted that, journalists feel the pain of March Madness, too. It’s funny, because my experience was bittersweet. Back in 2011, everything was going the way I intended. I just knew I had the perfect bracket. I was a student at Virginia Commonwealth University at the time, in my senior year, and the Rams had secured a spot in the tournament by the skin of their teeth. So when the brackets came out, I wasn’t biased in making my selections. I had VCU, which was an 11 seed, winning in the First Four round, as well as in the Round of 64. But I had no idea Shaka Smart’s troops would go on such a magical run and make it to the Final Four! I had VCU losing to Purdue in the Round of 32 that year. The Boilermakers were a 3 seed and a team I expected to go deep into the tournament—to the Final Four, to be exact. But once VCU got rolling, how could I not enjoy the ride? The streets of Richmond were flooded with cheering fans following each and every upset the Rams pulled off. So my bracket became slightly a mess, but watching my school make that incredible run was well worth it. It was an experience I’ll never forget. Last year Cincinnati and Houston were my squads. I loved the draw for that particularly gritty version of an always-gritty Bearcats program. I had them rolling through a South region full of overrated major conference teams, right into the Final Four. There, they were slated to meet the Cougars and, most importantly, Rob Gray’s manbun. A 6-seed or lower had reached the deciding weekend every year since 2013, and I was certain this balanced, dangerous Houston group was the pick. After the first round, things were going according to plan. Then, like a Darius Washington trip to the free throw line, heartbreak. First, Cincinnati blew a 22-point lead with 11 minutes left against Nevada, ultimately losing by two. That would tie the second-largest comeback in tourney history. Houston’s loss was even worse. Up two with 3.6 seconds remaining, Devin Davis went to the foul line to ice things. Davis had previously gone 9-10 from the stripe, but he missed both. Then, in a classic One Shining Moment moment, Jordan Poole hit a slingshot from pretty much halfcourt. My bracket was shattered. So was I. In 2006, picking a top-ranked and eminently hateable Duke team led by J.J. Redick to go all the way was simply out of the question. Instead, I threw myself into my bracket research and ultimately put all my chips on Iowa, owners of the nation's best defense according to kenpom.com (Note: I did not know what kenpom.com was as a high school freshman) and winners of a hard-fought Big Ten tournament. I spent no time worrying about my national champion's first-round game against Northwestern State, watching Iowa build a 17-point lead with 8:29 remaining on the transparent scoreboard floating at the top of another broadcast. (This was back in the primitive days when not all first-round games were nationally televised.) Suddenly, that margin stopped growing, and I could only watch and sweat as the Demons battled back to within one. CBS finally cut over to the game as Iowa missed a free throw that would have pushed its lead to three with 14 seconds left. At the other end, Jermaine Wallace ran down a long rebound and launched a wild fall-away three that found nothing but net with a half second left. My tournament was ruined—until Duke crashed out in the Sweet Sixteen. 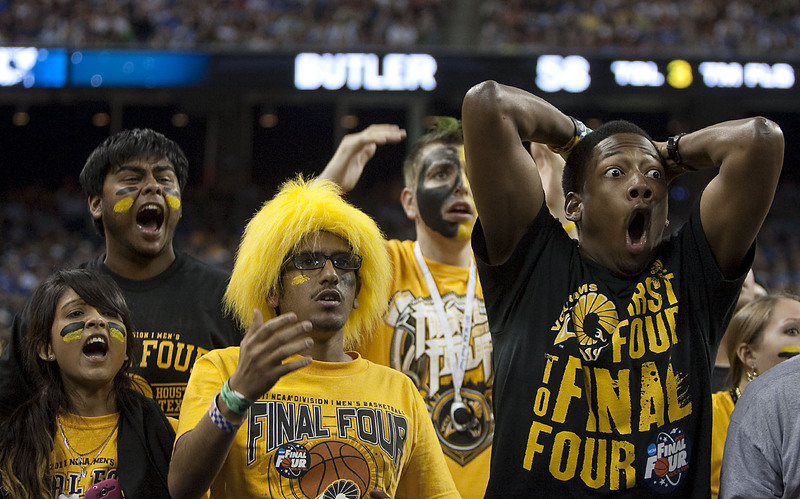 In 2014, I was very, very into the concept of Wichita State winning the national title. For some reason, the aura of Ron Baker and shiny 34-0 record in the Missouri Valley convinced me. As the resident college basketball nerd in high school (read: I had a kenpom subscription), I also convinced my future prom date to take Wichita State, as well as a few other saps. My dad, on the other hand, took Kentucky to beat them and make the Final Four. Anyway, the missed three to end the Shockers season in the Round of 32 haunts me to this day, and my prom date has not filled out a bracket ever since. In 2015, there was Kentucky and everyone else, but if you wanted to win your bracket pool then picking someone else was the smart move. If you somehow had the surprise national champion, you would've been almost guaranteed victory in a world where everyone else had Kentucky. My choice: Iowa State. The Cyclones had skilled, veteran lineup led by future NBA role players Georges Niang (Jazz), Monte Morris (Nuggets), Abdel Nader (Thunder) and Bryce Dejean-Jones to go along with dead-eye three-point shooter Naz Long. They also had the narrative: they were hot, winners of the Big 12 Tournament and five straight games overall. Their first game came at 12:40 p.m. against a UAB team I knew nothing about. I didn't even consider it. Instead, the Cyclones shot 26 percent from deep, Niang went 4-for-15 and they were out of the tournament before I was even home from school. I was such a great judge of talent as a 14-year-old that I could tell Texas freshman Kevin Durant was a really good player. I was so confident in Durant’s abilities that I picked the Longhorns to win the whole tournament, because I had recently learned that it was bad to pick a chalky bracket. So I marked No. 4 seed Texas as my national champ and felt like a genius as Durant cooked New Mexico State in the first round. KD also lit up USC in the second round, but the Longhorns lost by 19 and I learned an vital lesson about the importance of team basketball.